Earth-Moon Distance, oil on linen, 18 x 30 inches, 2010, collection of the artist. The cause and purpose of god's invention and gift to us of sight was that we should see the revolutions of intelligence in the heavens and use their untroubled course to guide the troubled revolutions of our own understanding, which are akin to them ... The same applies again to sound ... all audible musical sound is given us for the sake of harmony, which has motions akin to the orbits in our soul, and which, as anyone who makes intelligent use of the arts knows, is not to be used, as is commonly thought, to give irrational pleasure, but as a heaven-sent ally in reducing to order and harmony any disharmony in the revolutions within us. Rythm, again, was given us from the same heavenly source to help us in the same way; for most of us lack measure and grace. This painting follows a common pattern in my work where I start with things small and close at hand but try to 'open up' the picture to things of greater scale and significance. The intention is to create a microcosm, a compressed or metaphorical image of the world. 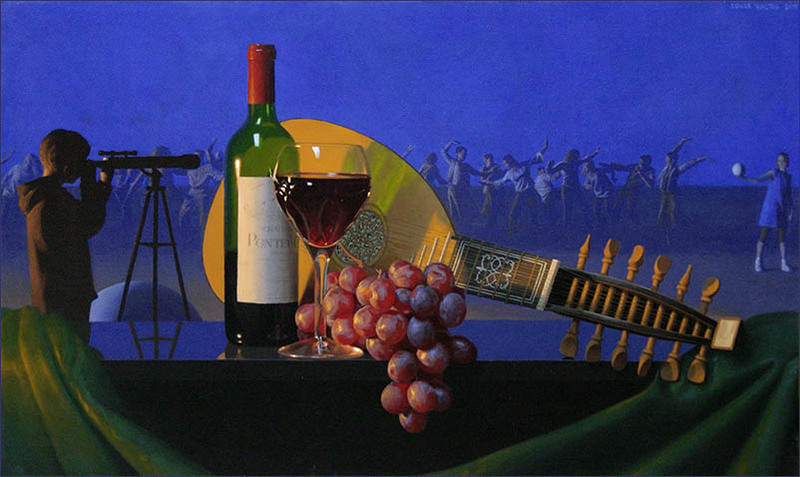 'Earth-Moon Distance' is a Dionysian picture, hence the grapes, wine and musical instrument in the foreground and ecstatic dancers in the background; wine, music and dance being our most obvious avenues toward ecstacy, intoxication, loss of self, oblivion. The background invokes the Pythagorean idea of the 'music of the spheres', in which celestial bodies are imagined as involved in a vast cosmic dance to a music that is inaudible but which we approximate crudely in our singing and dancing. The boy and girl in the painting, enacting the motion of earth and moon, are engaged in this silent dance. Their attraction cannot overcome the distance between them; they will never truly become one; their longing for completeness will never be satisfied - and yet they are bound together by invisible threads, their relationship is ordered, serene, harmonious. They are acting out an ideal love, what we can only approximate in our real human relations. 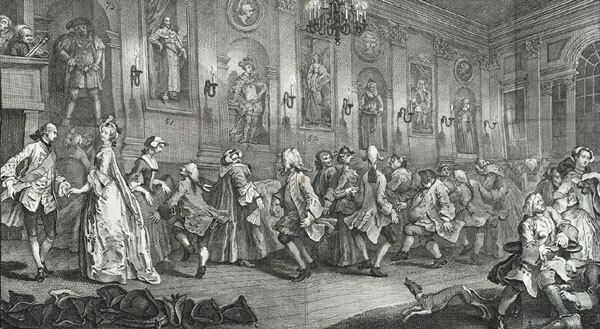 There is a model for this painting in an image from William Hogarth's 'Analysis of Beauty' in which a dance takes place where most of the assembly are engaged in a rather comic 'knees-up' while two superior-looking dancers glide past each other calmly and gracefully. The latter are meant to embody beauty, order, civilisation, everything Hogarth espouses in the book, but he obviously had more fun drawing the others!